During the 2015 Turner Classic Movie Cruise, actress Eva Marie Saint discussed how Elia Kazan, directing her in On the Waterfront (1954), wanted her to work from the inside out in the Method acting style. Brought up by nuns and totally innocent, her character, Edie, is exposed to brutality on the docks and must sacrifice her purity to participate in a fallen world so that others can be saved. Her character serves as a Christ-like figure and is one of the many instances of Christian symbolism in the film. On the Waterfront focuses on corruption and mob influence in the longshoremen union, led by the ironically named Johnny Friendly (Lee J. Cobb). The cruel Friendly and his goons decide who will work on any given day and whether they will have to do backbreaking work or pull easier assignments. These exploiters skim money off of the union dues, take a cut from the payment for work done and keep the workers impoverished so that they must borrow money from the union and pay loan shark interest rates. The workers must be “D and D” (“deaf and dumb”) when it comes to the strong-armed tactics of the union leaders — if not, their lives can end violently. 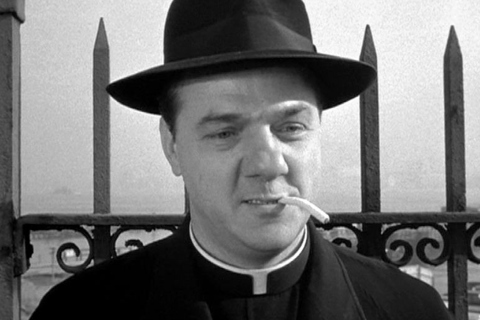 One worker, Edie’s brother Joey Doyle (Ben Wagner), falls to his death from a rooftop because he is ready to expose the corruption to the Waterfront Crime Commission, while another longshoreman, Kayo Dugan (Pat Henning), is killed on a ship after he tells the priest Father Barry (Karl Malden) that he will testify against the bosses. At the scene of Kayo’s death, Barry gives a speech, saying that Dugan’s and Joey Doyle’s deaths were “crucifixions,” because they are killed for their willingness to courageously put themselves in harm’s way to help others. Father Barry can be seen as following a path similar to that of Edie, and she shoves him in that direction. Edie knows a few things about the Catholic faith: her father sent her away to study with nuns and become a teacher, so she could escape the depressing world in which her father and brother toiled. After Joey’s death. Barry tells Edie that if she needs him, he’ll be at the church. She says with anger, “Did you ever hear of a saint hiding in a church?” It is then that Barry leaves his cloistered sanctuary and puts himself on the line for the tormented workers. The man who becomes the primary Christ figure in the movie is ex-professional boxer Terry Molloy (Marlon Brando). At the beginning of the film he is one of Friendly’s lackeys, following the lead of his brother, Charlie the Gent (Rod Steiger), Friendly’s right hand man. Unaware of the union boss’ plans for Joey Doyle, Terry is duped into leading the man up onto a roof and to his death. While he shows parallels to Rick in Casablanca early in that story, feeling that the only side to be on is his own, Terry starts to suffer from an inner fight with his conscience. Due to this moral awakening, he tries to warn Dugan that his life is in danger and is goaded into action to testify against Friendly by Father Barry. Allusions to Christianity inform not only character development but also the film’s visual language. Throughout the film, in an allusion to Christian iconography, TV antennas on the roofs resemble crosses. When Charlie refuses to kill his own brother, he joins the list of those sacrificing their lives to bring about moral change, and his body is hung up on a hook, creating another crucifixion image. When Terry confesses his role in Joey’s death to Edie, there is a blaring sound of a ship’s horn, almost as if the angel Gabriel is sounding his instrument, announcing Judgment Day. Further, Jimmy Doyle’s jacket is given to Dugan and then passed on to Terry, like a relic from a martyr. Finally, when Terry breaks the glass on a door window to protect himself and Edie from Friendly’s henchmen, he bleeds from the hand like Christ being nailed to the cross. After he exposes Friendly, Terry does not run and hide; instead, he goes to the docks to claim his right to work and lead by example. The other workers finally defy Friendly and say they will only work if Terry does. Even after being beaten by Friendly’s goons, Terry drags himself to the loading dock to put in his day’s work. His fellow longshoremen follow him, pushing Friendly aside. Terry may have lost his actual brother but he has now become part of a brotherhood of men. In an earlier conversation, Edie shows her Christian upbringing in explaining to Terry that we are all responsible for caring for everybody else. In his eventual act of moral courage, Terry is fully converted to her way of thinking and is elevated to a higher ethical level.